We are all familiar with the saying “curiosity kills the cat”. But does this apply to people who you want to hire at your company? While a certain amount of curiosity is always welcome, what are the things you should look into before hiring a candidate who showcases qualities of curiosity? Will curious people or this curiosity turn out to be an asset for your company? Curiosity can be defined as the insatiable thirst for knowledge, the eagerness to learn, and the push to take those extra steps beyond what anyone else has. Intellectually curious people are those kinds of people who you will always find to be one step ahead the others, their quest for knowledge is never ending. Curious people are seen to be always on the edge of their seat. They are ever ready to learn new things, expand their knowledge base, and you will find these are the people who regularly attend seminars and workshops. They are very flexible, dynamic individuals, and are always full of questions. People who are curious have an innate need to expand their knowledge and skills. They are the people you will find always saying “More! More!”. Curious people are almost never satisfied with what they already know. They want to gain just a little more knowledge, or be able to do just a little more than before. This turns out to be an advantage both for them as well as your company, because they are always at the top of their game. They will look to update their skills, or even learn new skills, which could turn out to be an asset for your company. While some people are more than okay with following a set of guidelines, playing by the rules, and keeping a routine, curious people are never going to be satisfied by this. Curious people are naturally very creative, and tend to think outside the box. They are the ones who will come up with the weird but appealing ideas and steal the show. Having a curious person as an employee would greatly benefit your organisation. Why Curious People Make Better Employees? A curious person might be seen trying his level best to fit in with the rest of the employees, but somewhere, curiosity gets the better of them. Curious people make better employees as they are always willing to learn more, and even pick up these skills or knowledge faster than average employees. Since it is their innate nature to want to know more, it helps give them that motivation and drive to always expand their skills and knowledge. This could be a valuable asset to your company. Curious people are known for their want and need to wander previously unchartered territories. While some of your employees may be satisfied with working along the lines of previous employees or their own previous successful work, this is not the case of a curious person. Curious people understand what the phrase “Work smarter, not harder” means. If there is a better way of doing something, you can count on a curious person to find it. Due to their insatiable thirst for knowledge, curious people can infact, make very helpful employees. They work very well with clients, as they always ask questions and show genuine interest in the needs and problems of a client. Curious people are always willing to help, and find new and better ways of doing the same old job. Due to his nature, curious people make good employees who can work in teams, as well as work well alone. You can count on them to get the job done. A curious person can be seen, at any time of the day, always doing something or the other. There are restless people, but can also be very patient when they have a task in hand. Curious people always love to research and find out new ways of doing things. This quality can be very helpful in an office environment, as you will always find them ready with new ways and tips and tricks to do tasks. They make sure to drive out monotony from the workplace, and create a fun working environment. Curious people cannot be created; they were born that way. Curiosity is a part and parcel of these people. In their own quest for knowledge, curious people can be very important in bringing new information and knowledge to the company. They might have read about something somewhere, or seen some video of how something can be done in a different, even better way. This information can be priceless to an organisation, often paving ways to new discoveries and cost cutting methods never before applied. Curious people are natural problem solvers. If something cannot be done by someone else, you can rely on a curious individual to somehow get the work done. During your interview process, there are certain questions you can ask your candidates to determine if they possess this quality (curiosity) or not, and how they have utilized this quality in their lives. 1. Did you learn anything new in the past six months? What was the result of this? How did you go about the process? By asking this question to your candidate, you will be able to get an insight into their hobbies outside of work. What kinds of things interest them? How they went about this new learning? How long did it take for them to take on this new skill and how are they using it in their daily life. Curiosity does not only stop at the want to learn new things, you will also have to go about actually acquiring this knowledge and skill. Some people may want to impress you and show that they are intellectually curious- but this can be limited only on paper. In reality they might have done nothing to actually douse their curiosity. This question and their response to it might be helpful in sifting the real ones from the impersonators. Before you interview your candidates, or even during your interview, give them a task that requires a certain amount of research on their part. Give them a time period to complete this task, and review it. It can be something as simple as coming up with an ideal proposal for a client. Ask them to walk you through how they came up with the idea, and how they want to go about it. This sort of a project might be very simple but at the same time requires some amount of in depth study. You will be able to determine their curiosity by seeing if they just copied some idea off the internet, or actually did valid research to come up with new innovative topics. The time taken to complete this task will also help you determine their levels of dedication to the project. Curious people will ALWAYS have a ton of questions up their sleeves. If a candidate does not have any questions, or he resorts to basic questions which are expected, this should immediately be a signal for you about their levels of curiosity. A curious person not only wants to take information, they are also always ready to share information with others. This is why having an intellectually curious person on your team will always be an advantage to you and your company. They are the ones who will dig deeper and look into matters which others may have over looked. 4. What skill do you feel that you are missing, or could work more upon? The hallmark of a curious person is their constant need to update their knowledge and skills. If a potential employee tells you that he is satisfied with himself and the skills he possesses, this should come as a red signal to you. As a company, growth, development and change are words consistent with your motto. A curious person will always show an active interest in learning, and show adaptability to change and growth. These are all valued assets to a company. The skills your candidate wishes to expand will also help you understand his values and philosophies, what he considers important, and how these skills can affect your company. 5. Ask the candidate to teach you something then and there. It might be a skill, or sharing some new information or knowledge. This question will reveal several underlying qualities of the candidate. Firstly, a curious person will always be ready with something new to share. He must not only possess this knowledge or skill, but must also be ready to share it with others. This is an important test of teamwork which will affect how he works with the other team members of your company. Secondly, the candidate should be having proper technical knowledge of the skill. The way in which he teaches you, his patience and his delivery of words and the actual knowledge or skill will help you understand what kind of a teacher he is. This is integral as hiring a curious person who is unable or unwilling to teach others would be a liability to the company. By asking these simple questions to potential employers, you will be able to get an insight into their personalities, their skills, their work culture and ethics, and how appropriate they would be for your organisation. After you have hired these curious people into your organisation, you must remember that it is also important to actively cultivate curiosity in your organisation. 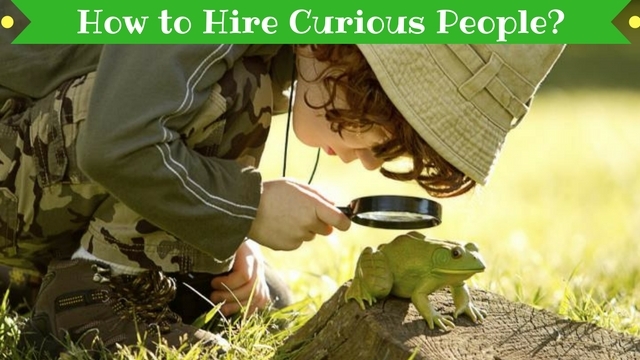 As an organisation, just hiring curious people as employees is not enough. You must also know how to cultivate curiosity in your own organisation. Do this by providing period and consistent learning opportunities. This can be done by holding periodic seminars where employees have a chance to learn new skills or update existing skills. You can also hold training sessions where trainers from outside come into your organisation and provide new learning opportunities. Within your organisation, make sure the environment does not turn into an “All work and no play” sort of a deal. Banish monotony by setting goals, making teams and playing work related games, or setting realistic targets and providing positive reinforcements if they are achieved. Most employees get used to a certain style of working. Once they reach their comfort zone, they hardly come out of it. This could cause monotony and a certain form of stagnation which is not good for the company. A company must strive to be ever changing, ever learning and dynamic in their approaches. Have regular talk sessions with your employees where they can share their experiences and skills with each other. Ask them to talk about their methods and ways of work, and how they themselves feel they can improve on it. Make everyone feel like an active member, and give them small tasks where they can compete with each other. This promotes healthy competition, and helps cultivate curiosity in even the most basic employees. Truly curious employees will always be an asset to any company. Making the right choice and hiring the right candidates can affect growth patterns of a company either positively or negatively. Curiosity helps one become adventurous! Next articleWhat is the Difference Between CV, Resume and Bio Data?